It’s wonderful to hear you are not in pain Lecretia. You are such an inspiration and a breath of fresh air. How wonderful there is no pain and you are cocoon ed in love. If wishes could only come true, you are a brave family. Sending love. Lucretia and those who care for her are amazing, tho the word does not seem sufficient. Thanks for sharing this with us, and the many others who suffer as Lucretia does. Having lost two dear and close friends with brain tumours, I can sympathise with all involved in this, tho I realise my feelings won’t change anything, I understand as much as one can without experiencing it personally. I sat for many hours holding my friends hand in hospital, when the only communication she was capable of was a light squeeze when I went to move. So I stayed. My thoughts to her and the loyal true friends who support her. So hard to watch. No one should have to endure this illness to the inevitable end. So beautifully written- thank you for sharing and all strength and love to you both from one “lady lawyer” to another. You are an inspiration. Such a courageous lady and truly inspiration.Much love being sent your way. There is a move in the NHS towards 24/7 service. Wd should expect the same here maybe even beat them to it? You should not have had to suffer this. Wishing you peace and tranquility for these special moments together. Your strength of character will be enduring. I think of Lecretia daily… I genuinely hope for the judgement to come through quickly and that it is the one she wants… this is how it should be! All my thoughts to you and yours, Lecretia. Beautifully written Matt! I’m so glad that Lecretia’s not in pain. On top of all else that’s going on at the moment, to have pain as well would be just awful. It’s really awesome that you two have lived so much together already and can turn to your amazing memories of holidays-past to cope as things are getting tougher! Lecretia, you speak for many people and you are so courageous to follow your inner feelings. Thinking of you and hoping that you can have your wish….you are an inspiration to all of us. My wish is that you are spared any more anxiety and the law recognises your right to determine your own future. So many people you have never met and will never meet walk alongside you on this journey and wish you and Matt love and peace. Sad words, so beautifully written. Thinking of you both. Words cannot adequately say what I feel. Your courage and determination will always live on Lecretia. I hope you get the answer you have fought so hard for while you are still able to comprehend it, and if you still desire, to take advantage of it. It is comforting to know you are free from pain and able to share such fond memories with those so dear to you. My wish for you is that you continue to remain pain free and able to communicate with your loved ones till your time comes. Go gently on your journey. This world is a better place for having had you in it. Love and strength to your family. I so feel your pain. We lost our precious dad far too early from a brain tumour. All the symptoms you have described takes me back 10 weeks ago. It’s all so very raw. You are so brave the both of you. Hold each other, tell her everything. There are things, when I think back that I wished I had said, but the grief and sadness was tearing me apart. Wrapping my arms around you both to give you big hugs. I have had a brain tumour removed but I have just had a brain scan and our doctor said my head appears to be okay. I need to see a specialist to check the results and find out if I can drive again. It has been 1 year 3 months since this debacle began. I so feel for Lecretia and Mark, I am glad she is not suffering to much and I certainly wish her all the best for the results from the high court. Lots of hugs and love are shared with you. I also know that it is the partners and family that are hurt so much. At this moment in time I have much to be thankful for. I’m pleased to hear she’s not in pain, love to you both. You are a brave and courageous, lovely lady with a loving supportive husband and family. You have given many inspiration and I wish you all the very best in your journey and thank you from the bottom of my heart for sharing your story.Always in my thoughts. I testified via affidavit at Lecretia’s hearing last week, countering the Care Alliance’s evidence. I’ve been laying low on social media out of respect to Lecretia and you and your family. This post appeared on my Facebook feed, something I seldom look at, so seeing it compelled me to let you know how privileged I felt to add what little I could to Lecretia’s case. She is a wonderful, courageous woman and I cannot imagine how it must be for both of you to be going through this – though I have met neither her nor you, I am deeply moved by your experience. How much I hope for Lecretia’s wishes to be upheld by the court’s decision. My thoughts are with you. Thankyou both for sharing your journey it is heartbreaking.A timely reality check for us all.God bless and be with you. Kia kaha korua! Your steadfastness to what you hold to be a basic human right is both endearing and inspiring. I’m heartened at how the New Zealand public have rallied to your cause and the amazing support you’ve received to date. May the outcome of the situation you face be a positive one. Even if you don’t get your “wish” you have raised awareness and brought the issue to the fore. My thoughts will be with you and your family while you fight this battle for yourself and on behalf of those who wish they could. Thank you Lecretia and family, for sharing your story my heart is with you. Heart wrenching account of what someone must go through due to not having a choice. We choose everything else in our life and when to end it in these circumstances is also giving someone a chance to keep their dignity. I am a funeral director and so many people have wanted to go at their choosing rather than decline slowly and often bear pain they could have avoided. I hope you get the right decision, but either way you are amazing for trying on behalf of others too. Thank you. No matter what the immediate outcome, the awareness that has been raised around this issue by you will pay dividends for others Im hoping. So sad to hear this news today and will be thinking of you and yours over the next few days and no doubt weeks to come. God speed. U such a strong person.. So glad u got no pain. U in my prayers!! Lecretia you are an amazing lady and an inspiration to all, I hope you get your wish. Have been thinking of you and your family and how strong you all are. Sending love to you all. Brave, wonderful woman. God bless her. I am very deeply moved by your writings.My own father passed from the same cancer at a young (ish) age. I cant stop a very emotional uprising. What an amazing husband you are to this beautiful woman fighting til the end. Hope her legacy will help others. So proud of you both. Gosh, I’ve been following Lecretia’s battle since I first heard her talking with Catherine on 9 to noon some weeks ago. It’s stunning life can deteriorate so quickly and so cruely .. I lost my Dad and my Mum to cancer and totally understand why Lecretia fought to make herself heard with the goal of being able to make a choice. You are an amazing friend/husband and I really feel for you and your family. Having had a daughter with cancer, I can completely understand your stand on passing with dignity, my daughter is still alive and trying to enjoy living even though she’s still in pain every day, another call for the use of medical marajuana, which helps her cope, all the very best! I read your latest story firstly through the stuff website and finally through your own blog which gives more detail. I am astounded from what I have read in relation to what you have all had to go through in these past couple of days in order to get a hospital bed back to your residence. It’s one thing to have deliveries outsourced, but there should always be some form of backup to ensure such things as deliveries of hospital beds (especially) be completed and setup without family having to go through any other forms of pressure as you guys did. I do not know Lecretia or any of her family, but may I pass on my best wishes to all concerned and hope there is a speedy outcome from the court that will fall in favour of Lecretia’s wishes. Above all and everything else, individuals must be respected as to what sort of outcomes one wants in these situations. Floating in the lagoon at Aitutaki in the Cook Islands. My late husband and I have also had the pleasure to do the same thing. I hope this is what you are thinking about all the time, peace, tranquility, blue seas, eating baby coconuts, white sand and the warmth of the sun on your body and the joy of being with someone you love. It is a privilege to have known Lecretia for a little time…wonderful people like you Lecretia have an impact on those whose lives you touched even briefly. Go well, you are in my thoughts every day and I send loving thoughts for you to do as you wish. Hi to you all stay strong, you are all very brave and I wish you all the best. My thoughts are constantly of you going through this tough time, I saw my husband through this & it was so unfair. Lecretia you have constructed a wonderful legacy – your story, your braveness, your ability to reach beyond your strength to fight for your rights will be remembered by many and inspire others to do the same. They say we die three deaths, the first when our heart stops beating, the second when we are laid in the ground, and the third, sometime in the future when our name is spoken for the last time. Please know that your name will be spoken for many years to come as an inspiration to other young women to reach above and beyond – to fight for what they believe is right. When you are ready, young lady – peace be yours. I think you are both amazing. Lecretia for bravely battling not just your own illness, but campaigning for a choice I believe we should all be entitled to in similar circumstances. And Matt for bravely undertaking your own battle, setting aside your own fears and grief to be a voice for your beautiful wife. My thoughts are with you both and I am sorry that two people as special and devoted as you are in this situation. Matt, you both are an inspiration. To just be able to talk about the good times you have had together must give you both comfort. Treasure those memories. I am so sorry that you are having to go through this added stress to try and attain these important rights, for not only yourself but all the others that will sadly follow after you suffering unnecessarily. What a truly and amazing person you are Lecretia,we have been following your journey all the way, our thoughts and love are with you and your family, am glad you are feeling no pain, may God Bless you!! Thank you Lucretia for your bravery and inspiration. It is the right for you to choose which is important. Hi Lecretia, my name is Rodger and my wife Tania has a stage 3/4 Glioma. We are very proud of you and your tower of strength husband. Be strong, we are with you all the way. You have given us strength in our own plight to fight this ugly thing. What a remarkably brave lady you are. I hope that you have a peaceful departure. Know that thousands are praying for you and your devoted husband. KIA KAHA Lucretia and for your beloved. He writes so strongly of his respect, concern but ultimately his love for you. We too wish that you are granted the judgment you are fighting for. My husband and I are travelling on a similar journey to you both. He has CNS Lymphoma with an inoperable brain tumour that has not fully responded to treatment. We don’t know what lies ahead, but whatever that and whenever it is, we want to enjoy and make the most of our time being together. We have thought of you both often and anxiously await the results of Lucretia’s hard work in her fight for her choice. Thank you both so very much for generosity in sharing your journey. Much love and blessings to you both. Lucretia you are such a strong woman and an inspiration to us all. I pray that the judge finds in your favour. Kia kaha to you and your whanau. I’m so pleased to read that you are not in pain at this stage and nor would anyone hope that you ever get to suffer. You are an amazing lady and I don’t think there is anyone following your journey that would disagree. I hope you get the decision you have been fighting for but sadly I fear that you won’t. Stay strong lovely lady, I have never met you but you have touched my heart with your story. Thank you for this blog and my thoughts are with you both, God bless. Sending you both love and my upmost respect. I have been reading all about you and just wanted you to know you are in my thoughts.I do not know either of you but have a huge amount of admiration for you both. You probably don’t remember me but we worked together at Kensington Swan many years ago. I have been inspired (from afar as I now live in Helsinki) by your intellectual strength to undertake this cause and hopefully it makes Aotearoa a better place. Such a brave lady. Amazing husband at her side. May you have peace at the end with no pain. It is hard to know what to say or indeed to read this through the tears but I hope you both know there are so many people thinking of you and we are in awe of your love and courage. Firstly, I would like to thank you both for sharing your story and yet I wish that it was not your story…we all take the moments of our lives for granted and believe that we will have all the time in the world. Sometimes some of us don’t. And I wish with all my heart that your story was different. Lecretia and Matt you are both strong and courageous. I hope and pray that the Judge is the same and agrees with your wishes – that is gives you both the decision you have so hoped and fought for – tomorrow, so that you know your fight was fruitful. And when the politicians decide they have the testicular fortitude to do the same, – in the only sensible and compassionate decision they can come to – that your name, somehow, bears the appropriate legislation….Kia Kaha to you both and Lecretia you will always be remembered for this – no matter what happens. Thinking of you both Matt. I just want to send you my love. I hope the decision from the court comes soon and I hope its the outcome you wanted. I lost my brother n law to brain cancer he said he wished you had the choice to go when your ready. Sending you love and strength . 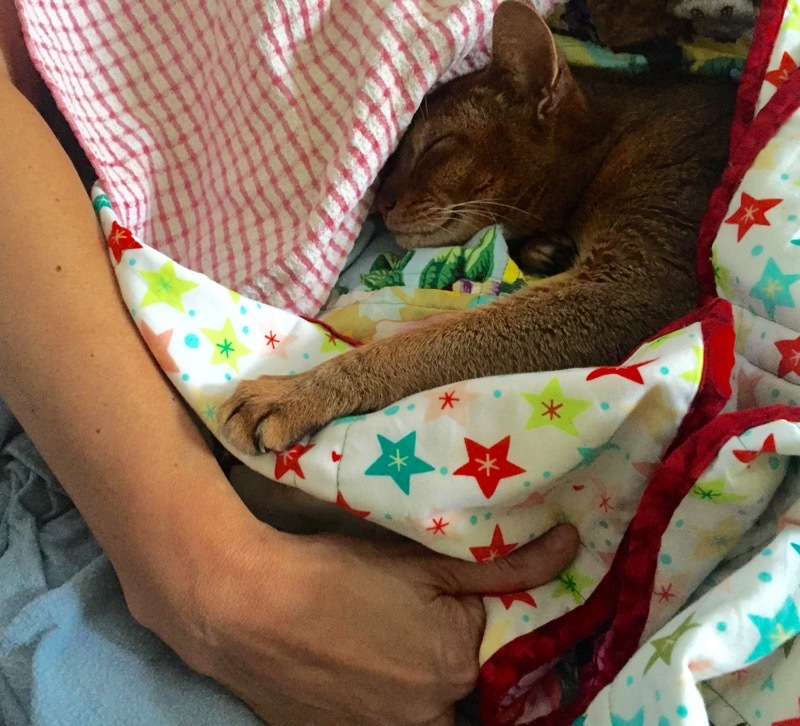 Hoping you will get excellent support from the hospice team, peaceful time with your nearest and snuggles with your lovely cat. Lecretia, you, your husband and family are an inspiration. Your life will not be in vain – it has made so many of us aware that we too may one day face the very same situation but even worse, not have the loving support. Thank you sincerely. Your time is precious, each day a bonus. You will leave a very positive and lasting memory. Upon their hands they will bear you up. Blessings and prayers that you may not suffer Lecretia. Prayers for Matt and family. The real choice in dying as in living is to surrender to the journey and find love in each moment. Every moment counts. Arohanui Lecretia, Matt and whanau. my heart goes out to you all, please feel the warm and loving hugs I have been sending for weeks, as you have all been in my thoughts every day. My hope is that Lecretia will be granted what she has asked, and will be able to freely make her choice, whatever that may be. I have the greatest respect for all of you. I have followed this because Lecretia’s choice would also be mine. Hugs from my heart. Lots of aroha to you and your whanau. Such an inspiration to us all. Kia kaha. I feel for you Lecretia, and for your husband and family. What an amazing Lady. Not only fighting for herself but for every New Zealander. Being able to choose the right way on our demise. When our animals whether a Zoo or Pet is badly suffering a trained or qualified Vet puts them to sleep. Why as humans is there so much controversy?? We all should be able to choose, have it written in our Wills that when we are unable to choose for ourselves, our Lawyer and our Doctor should be able to put us to sleep. Love and Best Wishes to all your Carers’, Husband, Mother, Father and Friends. What an inspiring couple. Yes Lucretia is incredibly brave but so are you. Your love and devotion is humbling. May whatever time you have left together create more wonderful memories and special moments. Keep being the knight I am sure Lucretia see’s you as. I don’t know you Lecretia but love you for what you have done to try and help yourself and potentially others. Kia kaha. Matt, you’re a bloody legend! Great news that so many people helped to ensure the hospital bed was delivered for Lecretia. Thank you so much for sharing such a personal journey, for bringing awareness to the community / country, and for being so brave in your resolve and convictions. We can only hope that those making the milestone decisions in your case, and inevitably for the many others who are bravely suffering, will be understanding and make the right decision. Having recently gone through something similar with one of my sisters I can totally relate, and my heart goes out to you both. Totally support you. Very best wishes. What a wonderful gift you share with us – the gift of love, caring and compassion. I truly pray that you both will get the help you need when the time has arrived. rest assured that many, many people think and pray for you and your family. To a wonderful and brave lady your face and name will never be forgotten. Every day my thoughts are with you Lucretia . Thank you for sharing your journey with us. May the Universe guide the court to acknowledge and respect Lecretia’s free will and autonomy over her own life, especially how it ends. Kia kaha koutou maa. I recently watched my dad pass away, with the open assistance of the District Nurses in our hometown, with the minimum of pain and suffering. It was termed palliative care, but I have no doubt that it was in fact an assisted choice to die at that time. The fact that these wonderful nurses have no legal right to do what they often end up doing, is a real shame. My mother and I have talked about the day that Dad died, where the nurses came and washed him, and moved his arms and legs into a more comfortable position, made an adjustment to the 24 hour medication pump he was on, telling us very pointedly not to ‘go any where, because it will happen very soon.’ We believe that they increased his morphine at that point, knowing full well that it would shortly end his life. If you do not get the decision you are hoping for, I hope that you find that Lecretia may be aided through her final days in this manner. It is a respectful, dignified and gentle way to die, and even if it is not acknowledged within the laws of the country at present, it is still a reality. No one should have to suffer agony at the end of their life, when we know that appropriate and powerful sedation is available. Thank you both, Lecretia especially, for the courage and openness in bringing this topic to light. For far too long now doctors and nurses have been forced to take the law into their own hands and end the suffering of those who are so close to death. Why can we not dignify their empathy and courage by admitting it, and accepting that it is simply what has been done for centuries in many different ways? Why not make legal what is already an established fact, and in so doing, ease the terror and desperation of those who are facing an uncertain, and potentially agonising death? The outcome is unavoidable – so why are we still forcing people to go through hell in order to get there? An amazing husband telling it how it is. Must be heart wrenching for him. What can I say after all the other comments that have been written. Thank you so much for sharing and fighting so hard for what you believe in. It bothers me that you have to fight to die with dignity, I so hope it is not in vein. My thoughts, prayers, (and warmth of my heart) are with you all that face the loss and grief including you to Lecretia. No one has the right to make choices for you – it is purely personal. I only hope she gets her wish in time – this is so cruel on Lecretia and her loved ones. Thanks for taking an action against the NZ Government – what you do, you do for all of us. I weep when I read of your bravery. I support Lucretia’s right to complete her life cycle in accordance with her own wishes, as I do any human beings right to decide how they will leave this world at their end. I do very much hope the decisions runs in her favour. If not, Lucretia there may be some very small comfort in knowing that your fight will be part of the process of desensitisation of this issue as we move forward. I believe that eventually others will benefit from your struggle. Peace and love to you and your family Lucretia. The thing is she does not appear to be suffering, she stated that she is not feeling pain despite not having pain medication. It is amazing what the body is capable of when having to ease itself into death. I know it must be very hard for the family to watch, but if this is about comfort at death then there is no need for her to choose to die as she seems comfortable. It is a very dangerous thing for a law that allows death to be planned as many will start to feel obligated to die when they become a burden. Life is about the struggle and the will to live and the lessons we gain from it. When we die, we are gone once and for all and there is no possible way to come back from that and have any more experiences such as that loving squeeze of the hand of a loved one. I know precisely how you feel holding Lecretias hand one can only guess how this brave lady feels.I would say comforted.Stay with her and blessings for you all. Such Courage and Dignity in adversity! Such Love – between you as a couple, and of life itself. Such Beauty in your writing, Matt. Such Respect from so many thousands of us to you both, Lecretia and Matt. Most of us wish to leave this world having ‘made our mark’, but not many of us are sufficiently gifted to do something as great as you in mounting this legal challenge about human rights, both to clarify your own legal situation right now but which may in future also benefit all of NZ. What an inspiration! My thoughts and empathy are with you both. I think you must be a wonderful man also to love and support Lucretia the way you do and hope for her that she is given the choice and does not have to continue to suffer the way she is. That she can leave with the obvious dignity she has. She is also extremely courageous and an inspiration. Arohanui, Kia Kaha, Joanne Donnell. Lecretia is such a brave, beautiful, woman. My heart breaks – for you both. What a truly amazing woman you are Lecretia and you have an amazing husband. I hope you get to see what you have fought so hard for come true before your time comes to an end. You have allowed so many people to share your journey and shed a tear for you. Thank you for allowing us to do that. Our thoughts are with you and your family. Thinking of you both, I am glad Lecretia has such a wonderful husband by her side during this time. Hugs and every good vibe I can send yr way as the next destination comes ever closer. One very brave lady I am full of admiration. If Lecretia does not get her wish hopefully she has gone a long way toward helping another who may find themselves in the same situation. My thoughts are with her and her wonderful supportive family and friends. You are such a wonderful couple and family only wish there was something I could do to help. Pleased to hear your not in pain Lecretia, keep dreaming of all the lovely holidays you have had together, your lovely friends and may your cat cuddle you always , loving thoughts to you all. hi lecretia my name is Andrea and Ithink ur so brave and strong and wish for 1 million Angels to watch over you. Lecretia you are a beautiful and amazing lady, with loving and very caring family around you. I pray your wish comes true for you. Thank you family for sharing this very special time with us all. I was thinking about you all last night. I hope that Lucretia, does indeed, have a choice. My heart goes out to you Lecritia and your whole family. The beauty of your smile, your out look on life and the courage you are showing is of the most outstanding and highest order. Words cannot adequately describe the deep thankfulness I have Lecretia for you bringing your case before the courts. Only you could have managed this and pleaded for humanity in your situation. The Medical Professional Body has not told the public the truth about their Medical inadequacies to help in certain terminal Medical conditions. I pray this Judge will exercise deep compassion to help you in his Judgement. This is a remarkable story. I am a nurse in neurosciences and have seen patients in a comparable situation on many occasions. I wish those against what Lecretia has asked for would recognize the difference between quality and quantity of life. I have had patients’ relatives as if there was anything which could be done to speed things up as their loved one would never have wanted to be in a totally dependent state. I have heard anti assisted end of life suggestions of “terminal sedation” to ensure comfort but not kill the patient. This is simply going to put a patient into the totally dependent state they wish to avoid. The legalization of assisted death isn’t going to make it compulsory. After all homosexuality and smoking tobacco are legal but you don’t have to do either of them. The law should be changed. Lecretia’s decision to go to court is courageous. I hope the court grants her the right to make the choice and she gets to hear this. We have a good palliative care system in NZ but that can’t do everything. People should have the choice Lecretia has asked for. How about a referendum on assisted death rather than a new flag. As a 12 year old, I held the hand of someone very close to me everyday, watching them die of brain cancer… The two weeks before passing were horrendous for us both… Please let there be peace and less suffering for everyone who must endure this. Hi Matt. As Lecretia’s end draws ever closer you need to also be assured the love and moral support of a Nation will walk beside you every step of the way and beyond the inevitable. Lecretia is a brave and courageous lady who has been most fortunate to have had you by her side. Your joint decision to share your lives and journey with the world is the ultimate gift to mankind. Thank you both from the bottom of my heart. I like many others on here also know what it is to care for and support a loved partner through their end journey. I wish you both peace and comfort for whatever time you may have left together on this earth. Lecretia will leave a legacy that will continue to live on well beyond our lives – The right to choose – A Nation salutes you. Have just seen the news that you have been given the court ruling and it will be released tomorrow afternoon. I so hope Lecretia has won her fight for the right to choose. Blessings, Love and light to you both. My heart weeps for you all, for a battle bravely fought. Cherish the memories, for they will last forever. Sincere and Heartfelt condolences to you all. Lecretia you were a Blessing to your family and to Humanity. Your courage is inspirational in the face of such adversity and the caring and love of your family for you at this very important time of your lives is a shining beacon for all of the Human race. Your fight will not be in vain. There will now be a momentum within this Country of ours like never before to have the right to choose our ending. Every human being should have that right. Lecretia has shown her deep concern and compassion for Humanity by bringing to our attention her personal fight in our Legal System for a matter so fundamental for us all, the Right to Choose an end to suffering. Thank you Matt and Lecretia for sharing your journey with us all. You have confronted an issue many have not really considered. Thank you so much Beautiful Lady for your compassion. Please accept my heartfelt sympathy on the passing of your ‘Special Angel’ Lecretia. It’s now been over a year since my Dad passed away after suffering from prostrate cancer and everything that comes with that. Your story has reminded me of Dads end, which was truly special in some ways but also horrific. He suffered. My brother and I, and our stepmother watched, loved and cared. He asked us to end it. Thank you so much for sharing your story. I am again motivated to support a change so that we may all have the choice to die with dignity.